SZENE supports the creative work of local artists and companies through working residencies in its Studio. 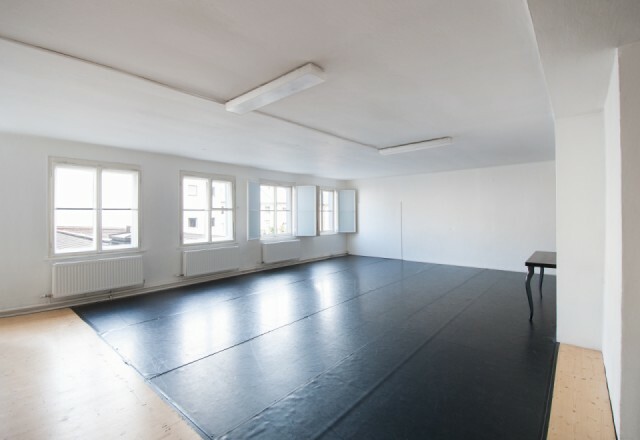 This is located on the third floor of the building and the size of the space and the equipment provided mean that the Studio is particularly suited to the rehearsal and development of small productions without complex technical requirements. The space can be used free of charge for a period of up to two weeks and it represents a significant contribution to the working process for many independent artists. The Studio also provides the opportunity to hold public showings supported by SZENE. Each year SZENE also provides several residencies for companies or artists from other regions in Austria and invitations to artists who are associated with the EU-funded APAP network. SZENE Studio is used almost 100% of the time. It was in use on a total of 317 days during 2017. 235 days were taken up by Salzburg-based performing artists – 13 of them working in the field of theatre and 17 in the field of dance. Rehearsals by APAP artists accounted for 54 days and a further 28 days were taken up with rehearsals by Austrian artists from outside the Salzburg region.